Divers have been warned of the dangers of silt around a sunken warship off the Cornwall coast after two divers got lost and drowned. Kaye Moss, 43, and David White, 42, from Gloucestershire, were on a diving trip on the wreck of the 113ft-long (34m) frigate HMS Scylla. The frigate was scuttled in Whitsand Bay in 2004 to create an artificial reef for divers and sealife. A verdict of accidental death was recorded at an inquest in Plymouth. The inquest heard Ms Moss and Mr White died because they failed to trail a line to show them how to get out of the ship which rests in about 65ft (20m) of water. The pair, who were with members of South Gloucestershire Sub Aqua Club, had more than 200 dives between them. They had dived into the central corridor of the Scylla but had then gone into a small compartment where their movement and the bubbles from their scuba kit stirred up silt which has settled since the ship was sunk. A diving expert told an inquest in Plymouth the two victims should have used a line because of the danger of becoming disorientated by the sudden change in visibility caused by the silt. Plymouth coroner Ian Arrow said: "They decided to penetrate the hull to explore it as a curious person might. They did not tie on a line and once inside the silt was stirred up and they became disorientated. 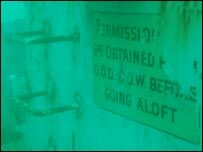 "I am satisfied they were trapped within the hull and sadly, both remained trapped until their air ran out. "I hope this case leads other divers to reflect on the hazards and the precautions needed if they enter a confined hull space, particularly if it contains silt." Since the deaths in 2007 divers using the Scylla have blamed contractors working for the Ministry of Defence for dumping silt from dredging in Plymouth Sound near the wreck. The Ministry of Defence dredges vast amounts of material from the River Tamar around its base at Devonport to ensure the river is navigable for naval, commercial and leisure traffic. The Royal Navy has said dumping should only happen on the ebb tide (outgoing tide) to limit any deposits inshore on the beach and in shallow waters. The National Marine Aquarium, which was involved in the Scylla's sinking, said it was still safe for trained divers.